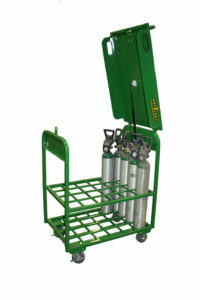 Similar to the MDE-12, the MDE-24-T carries 24 D or E medical cylinders. Its ultra-quiet casters roll soundlessly, making it perfect for hospitals and labs. Also available as a stand; just ask for the MDE-24-T.